The Natasha is an extravagant blend of effervescent blue, creamy white and fresh green. Stylish, attention-grabbing and guaranteed to turn heads, it boasts alabaster Oriental lilies, ivory anthuriums, creamy snapdragons and delicate orchids. The stand out flowers in this arrangement are violet blue delphiniums which are speckled throughout, creating a serene palette of colour. 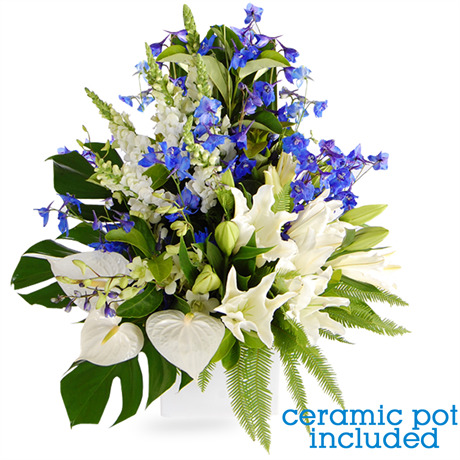 A sensational combination of tropical fragrance and aesthetic splendour, this luxurious floral masterpiece is suitable for all occasions and is incredibly popular for corporate functions and events.